Well, Sam and I are back home, although we still don't have carpet, and the kitties are still staying with Uncle Shawn & Aunt Jennifer until we do. We decided to take the opportunity of all the furniture and other belongings being willy nilly, and re-arrange and re-organize the house. 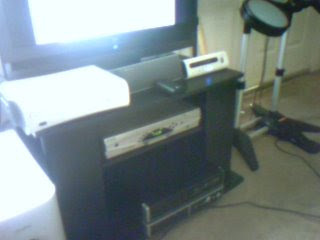 Sam got a new TV Stand, which is much smaller than our old one. He also got a new rug. Which is very handy 'cause bare cement isn't much fun to walk on. 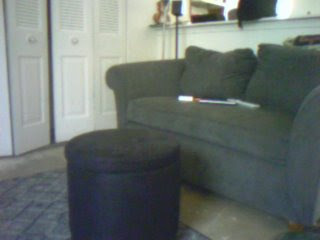 I bought us an Ottoman which has a nifty little storage bit inside. 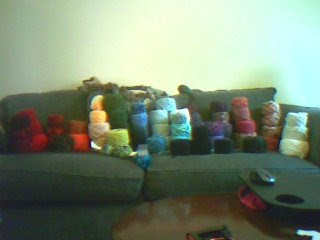 I've also taken the last day or so to re-arrange my yarn stash. I'd realized that I not only had filled up my rubbermaid container, but also had multiple large shopping bags, as well as 3-4 project bags filled with yarn. So I piled up everything that I'm keeping, and wound it all into balls. This task would have been impossible with the cats here, so it was a good time to get it done. Anything which isn't taken from there will go with me next time I visit my parents to be donated to my mom's church group. Big thanks again to Ben for letting us stay with him. I like Rainbows!!! Welcome home. 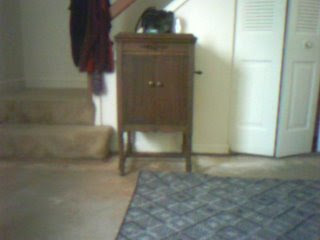 Now that you have reorganized, whatcha gunna do when they come to put the carpet in and un-reorganize it all? You know me.. I rule ;) Nah.. you guys are always welcome. It was a lot of fun having you over. it's an addiction; what can I say! Nice stash. You and I are modest stash-keepers compared to a lot of people. I've got one overflowing wicker laundry basket full and that's it. Sounds like you had a good time reorganizing and the new furniture is very nice.